day Gecko. It is believed to be the largest Gecko living in Madagascar. Generally the Banded Day Gecko was found in various parts of Madagascar but lately due to deforestation, it has become dislocated and cause of concern. When you look at the Banded Day Gecko closely, it has a flattened body that looks like a cylinder and short limbs. At the bottom of the toes, the banded day gecko has tiny hair like structures which are very crucial when it comes to climbing on slippery places. The head is larger than the body. An adult’s upper part of the body is either pale blue or blueish green in color. In fact the color looks like that of the bark of the trees that they inhabit and use for camouflage. 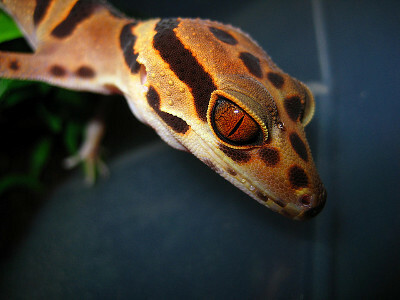 The under part of the Banded Day Gecko is beige. The young ones are blue grey whereas the juveniles have russet bands across the body which normally fades as they grow older. The Banded Day Gecko body’s length is around 12 inches (30.5 cm) and they weigh 1.5 to 3 ounces (40 to 80 grams). The female and male Banded Day Gecko are the same when it comes to size. The only difference is that the males have large well developed brown thigh pores. This is what distinguishes the male from female. The Banded Day Gecko feeding habit is a bit complex since it is rarely seen in the wild. But the Banded Day Gecko is believed to be omnivorous like other members of its species therefore, feeding on fruits, nectar, fruits and invertebrates. However, this is just a general observation so there is no field research to support this fact. If the Banded Day Gecko is kept in captivity it can either feed on other small geckos, insects or nectar. Breeding season of the branded day gecko commences in November going all the way to march. The Banded Day Geckos live in pairs where each mate has a partner. In cases where one partner dies, the other one can mate with another gecko. The eggs are laid on the leaves or under surface where in a duration of four and six weeks, the female Banded Day Gecko lays just one or two eggs. The eggs take around 70 days to hatch and thereafter the parents don’t take care of the young ones. The Banded Day Gecko are left to fed and survive by themselves. The young Banded Day Gecko reach maturity at the age of 1 to 2 years and so they can be sexually active. If kept in captivity the banded day gecko can live up to 12 years, but in the wild its lifespan is only 5 years. The Banded Day Gecko has special adaptations which helps it to survive on difficult territories. The toe’s bottom pads are covered with scales which are called lamellae and this enables it to climb on slippery surfaces as well as steep walls. It’s small and short limbs help it to hide under dry shrubs without being noticed. It inhabits trees, especially the baobab trees that it has a special relationship. Banded Day Gecko is believed to be the only reptiles in Madagascar that associate with the baobab trees. Banded Day Gecko has not been seen in any other habitats except wooden buildings but there are other species that live in deciduous dry forests and vegetation.